Are visitor passes secure and fit for the purpose they serve? Before getting into that, first let’s look at all the information a typical visitor pass includes? 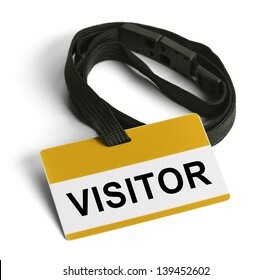 Visitor Passes have been used by businesses to control access and increase security by identifying the visitors and vendors entering the facility. 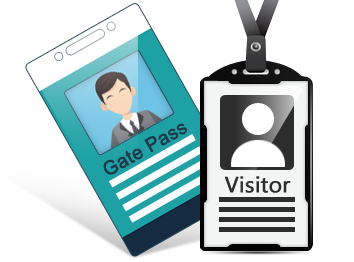 But many companies do not know the real purpose behind visitor passes and they simply make their visitor’s sign in just as good practice. Let’s see how we can quantify the good and bad, especially the bad side, of following such a practice blindly. What purpose does your Visitor Pass serve? Identification tool; The passes adds to the security of any building. 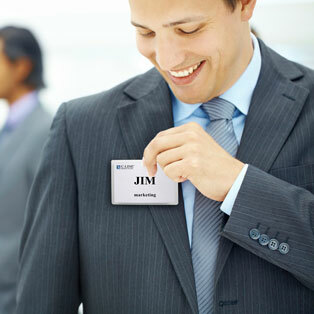 By issuing your visitor with a badge, it ensures that NO unauthorized people are on your site. Emergency purposes; E.g. in the event of a fire, a visitor tag can acts as a Fire Register. Auditing purposes; In secure offices, food production companies, schools and various manufacturing sites, etc, they have to adhere to additional regulations and the visitor passes allows for the visitors to be audited. All of the reasons might point towards a very well handled system of managing visitors that walk into your office reception area. A visitor pass is for the security of your employees and team members and there are a few loopholes in a visitor pass that needs to be taken into consideration. Let’s start of by understanding a bit more about the visitor badge first. What are the two main types of Visitor Badge? Common Visitor Passes: These passes are common to every visitor type and every visitor. All a visitor needs to do is sign in to visitor’s book and the receptionist/front desk office hands them a visitor badge. This badge has just a logo (or not even that sometimes) of the company and “Visitor” written in bold on the front of the badge. Customized Passes: These passes have a better approach. A visitor pass template is fixed by the business heads and information that is fed into a VMS or a Logbook, by the visitor at the time of check-in, is added to the visitor badge. Here’s how it looks. Why isn’t my Visitor Pass secure? While both of these visitor badge types do help in distinguishing employees from visitors, they don’t really keep the office secure. Why? Let’s look at some challenges with each of these badge types. 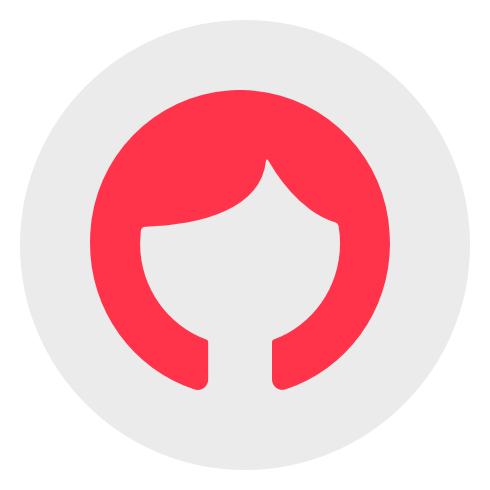 One of the purpose of having a visitor pass is to create an identity of the visitor. It can be used in an emergency or for general differentiation between the staff and your visitors. Not having an identity is just one of the problems with these common passes. While tracing back the visitor in the logbook you have no confirmation of visitor that came in. Also, if one guy takes the tag outside premise, then you can’t trace back that person which can be misused later. Customized Passes are way better in terms of visitor identification, even if it has just visitor’s names on it. But, then again, there are other problems that could arise out of the design of the badge. When the information on these little rectangles isn’t laid out in a way that’s clear, accurate, and helpful, there are consequences for both visitors and the companies they’re visiting. We know that visitors’ names only require a few simple text fields. But what happens when someone with an exceptionally long name tries to make a badge? Does the name spill into the next part of the badge? Does it ruin the layout causing delays in the reception area? Another example could be that of the visitor photo. The visitor’s photo is a great way to verify that a badge belongs to its owner. However, it loses its potency if the photo isn’t clear or doesn’t have the visitor’s face in the appropriate position. If you don’t have front desk staff available at all times to manually take visitor photos, you need a Visitor Management System like Ara, that uses facial recognition software to require the perfect positioning before issuing a badge. We’ll talk more about Ara in the last section of this post. Although we do remember saying, customized passes are better than common passes it’s not really the best possible solution to visitor security. The visitor’s name and check-in details may not mean much without additional information, such as their company name, their position, and the name of the person they are visiting at the host company. There are also a few issues that could occur with both these types of passes. These issues are not with the passes directly, but with the visitor information stored in the visitor’s book. 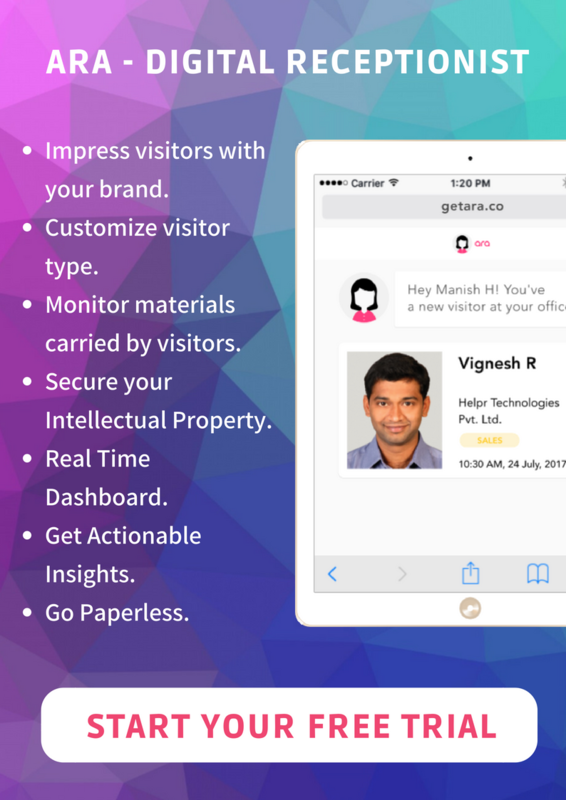 The visitor’s logbook is for capturing visitor data and keeping it safe. It doesn’t do that, then there’s no point of a badge, without information linking back to the logbook. Visitor Passes might seem like a small thing, but they make a big impact. The best companies know that paying attention to these kinds of details can make all the difference. If you have ever tried to provide the right kind of administrative services for your office, then you know that all these issues have be taken into consideration. To solve this, first we need to understand that a visitor badge alone cannot take care of the entire security of your business. It is the visitor pass and book/software duo that really makes a difference. Having a manual visitor log book or just having visitor tags in place cannot secure your office. A better alternative is to have a Digital Visitor Pass System or a Digital Visitor Management in place. The software and ebadges (visitor badges, just electronic) work together to give you maximum security at your office. Let’s see how. 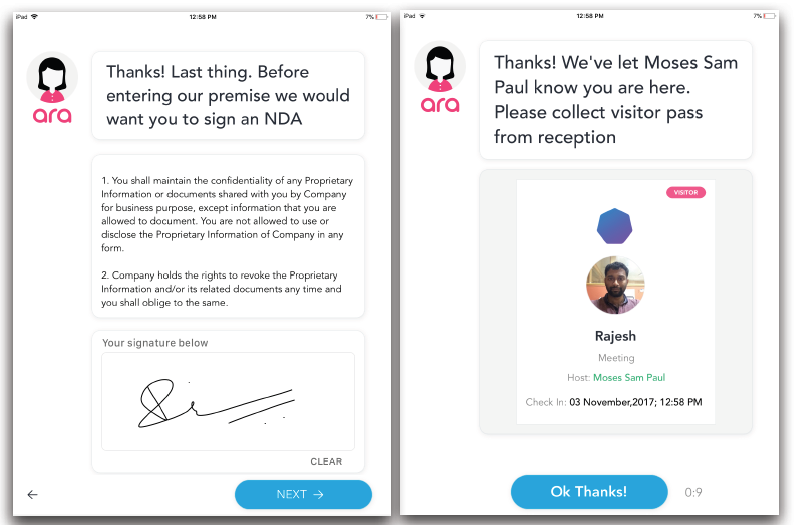 Let’s say a visitor comes and signs in to Ara Software, kept at your front desk. These visitor add their personal information into the software. The software confirms the details such as their phone number by sending them OTP and instantaneously takes their photos. It can even make them sign an NDA for security on business related information. It then instantly notifies host of their visitor’s arrival. All this within seconds of their arrival. They are then handed over an ebadge, which you should note, has verified high quality information. Also, that same information is securely stored away on the cloud. Their are even additional security measures you can with the help of the software. You may want to note visitors’ types or classifications on their badges and similarly on the visitor register. Visitor types often center around their roles (examples: Intern, Contractor, Presenter, Vendor) and can include security or access levels. So, to conclude, a visitor pass is a necessity to track any type of office visitors. Although, alone it’s helpless. But, if you combine it with a deadly visitor tracking software then there’s no messing with your businesses ever again.